Happy June everyone! Honestly, I wrote this recipe out back in April before Easter; I originally wanted to make Peanut Butter Eggs. The day I made these I did half eggs and half PB Balls. This recipe is slightly different than the usual ones you may see using rice cereal. This unique recipe uses my secret ingredient (sugar cones), which gives it a little bit of a crunch and adds to the sweetness. -Melt butter first then add the peanut butter and vanilla until creamy. -Gently mix in the crushed sugar cones and powdered sugar until combined. 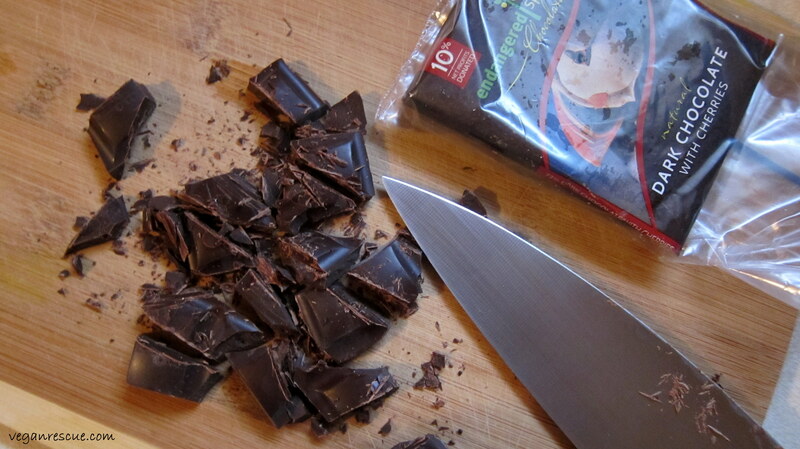 -Place in the freezer for about 10 minutes while you prepare the chocolate for easier handling. -Roll peanut butter into balls or mold into desired shape, like eggs for Easter! -Combine all ingredients over a double boiler (for a better consistency) until smooth. Or you can microwave for about two minutes stirring in between. -Drizzle melted chocolate mixture over peanut butter balls and place back in the freezer for 10 minutes (I am impatient or refrigerate overnight. Enjoy! -Melt butter first then add the peanut butter and vanilla until creamy. Gently mix in the crushed sugar cones and powdered sugar until combined. I hope you try this one, it is so simple. I place them in the freezer to harden up a bit, mostly because I’m too impatient to wait 2 hours in the fridge or overnight. However, you can certainly make these ahead and skip the freezer part, by storing them in the fridge instead. I reference it makes about 3 dozen because I made exactly 35 cookies. When I wrote this recipe out I anticipated 1/2 cup of chocolate chips but ended using only 1/4 cup. Hope you enjoy! 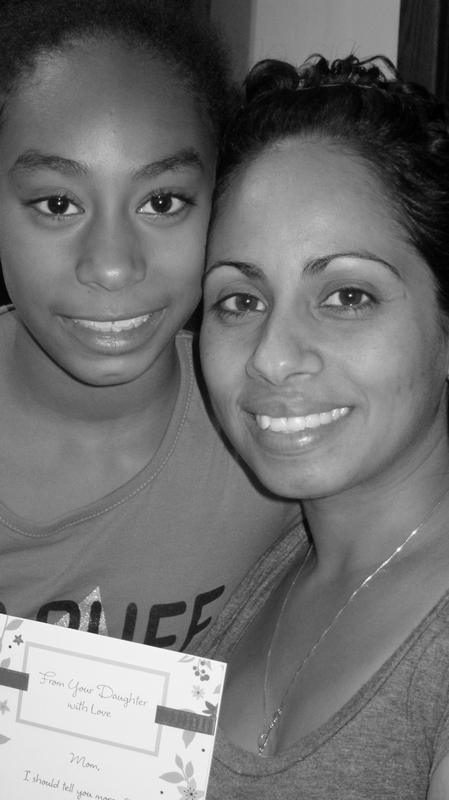 2/3 Cup Earth Balance (vegan butter), softened –room temp. -Oven should be pre-heated to 375 degrees F.
-In a bowl cream together butter (E.B.) and both sugars-brown/granulated. I beat at low speed with my hand mixer until mixture is creamed together. -To the sugar mixture add: vanilla extract and applesauce then cream together again until combined. -In a separate bowl – sift (or I prefer to just whisk) together: flour, cocoa powder, baking powder/soda and salt until combined. -Add wet mixture to dry mixture and slowly combine – I found that using a silicon type spatula works the best. The mixture should look creamy like icing. -Cover with plastic wrap and place mixture in the freezer for 30 minutes. -Spoon out about a tablespoon or use a small cookie scoop (works the best) into the palm of your hand. Make a small well or hole with your index finger. 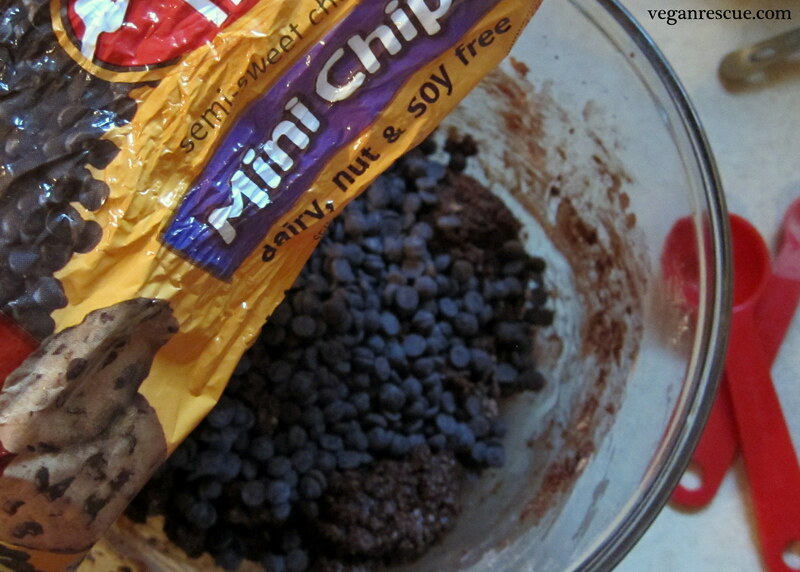 Add the chocolate chips and seal together. Roll to form a ball. Place your powdered sugar in a separate small bowl. Finally, roll your cookie dough ball into the sugar. -Bake for 7-8 minutes to perfection. Cookies will be soft chewy and gooey in the center. I’ve baked for as long as 11 minutes for a crisper cookie. -Spoon out about a tablespoon or use a small cookie scoop (works the best) into the palm of your hand. Make a small well or hole with your index finger. Add the chocolate chips and seal together. Roll to form a ball. Place your powdered sugar in a separate small bowl. Finally, roll your cookie dough ball into the sugar. 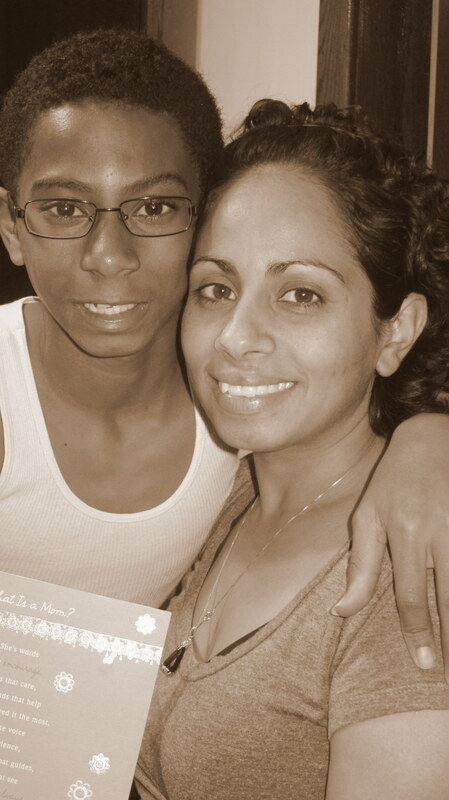 Celebrating and so thankful for another year! 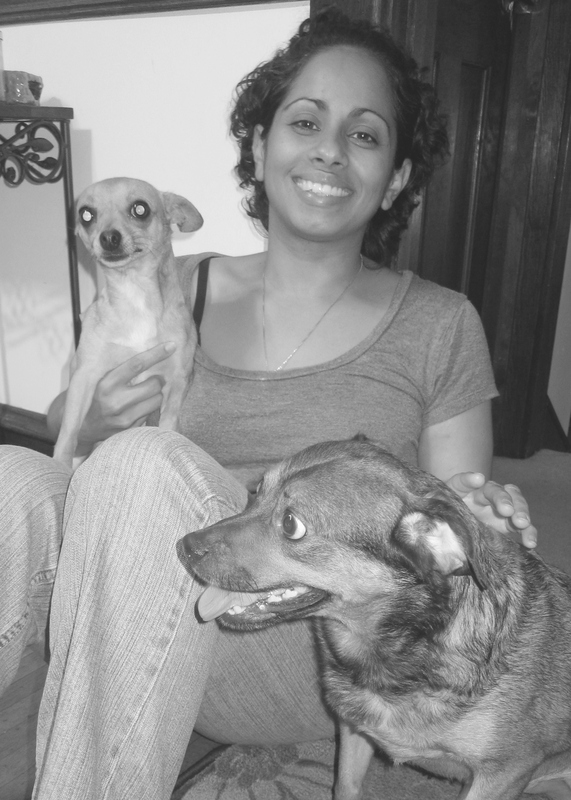 What a blessing to have my family – husband, children including my two little monkeys (Brody & Beanie). Thankful also for school and this blog too, so blessed to have the opportunity to express my passion and reach so many people. I had an easy going day today and made some easy going brownies. 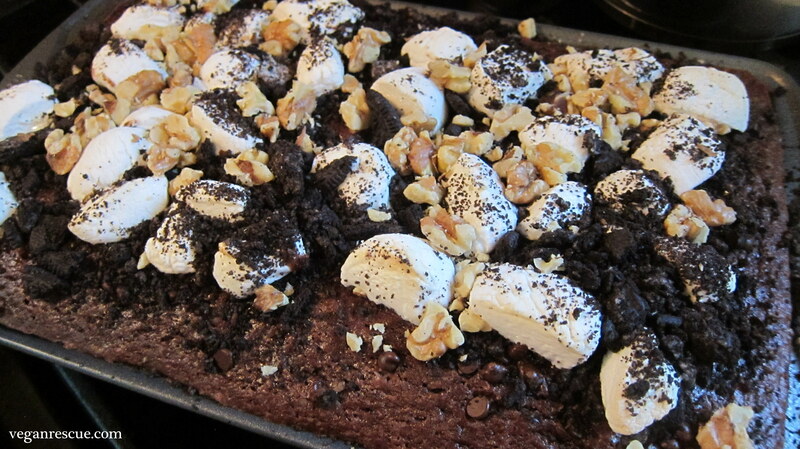 Instead of a cake I decided on brownies because they are so quick and easy – 20 minutes. 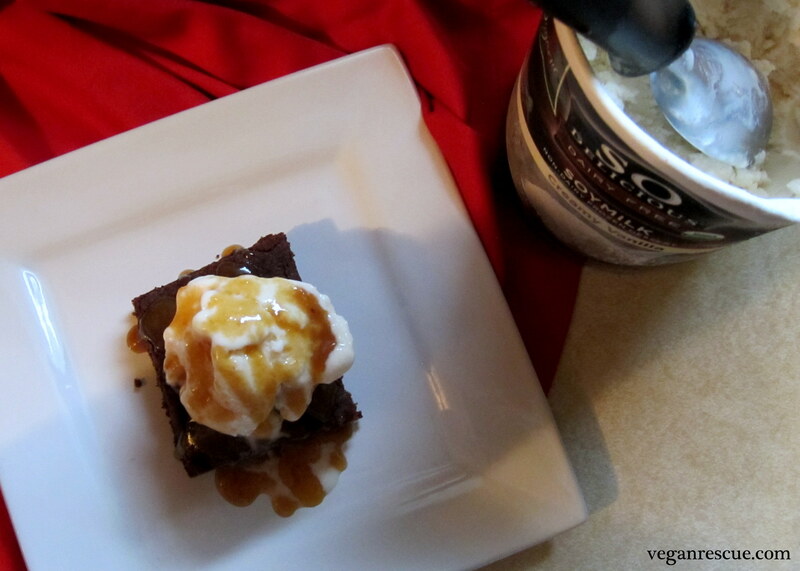 Same recipe as my brownies with salted caramel except today without the caramel. 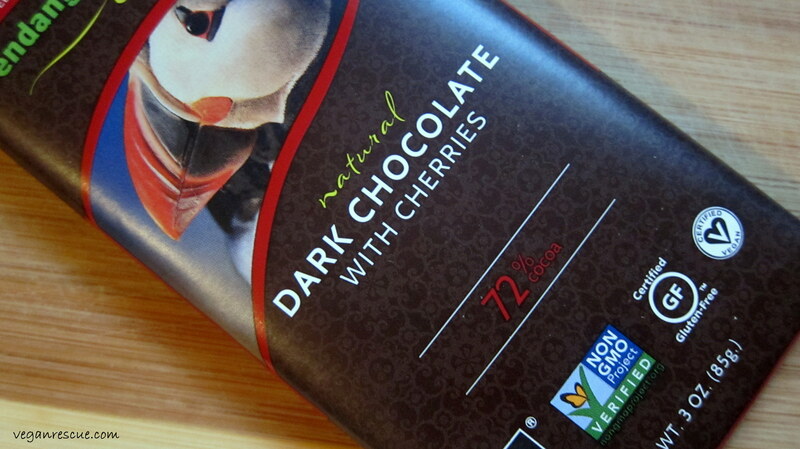 Also, I did not have the chocolate chips, however, what girl doesn’t have a chocolate bar on hand? Instead of the chocolate chips I chopped up 7 squares from a chocolate bar, delicious! That is the best thing about these recipes you can interchange ingredients and easily create something new! Enjoy! 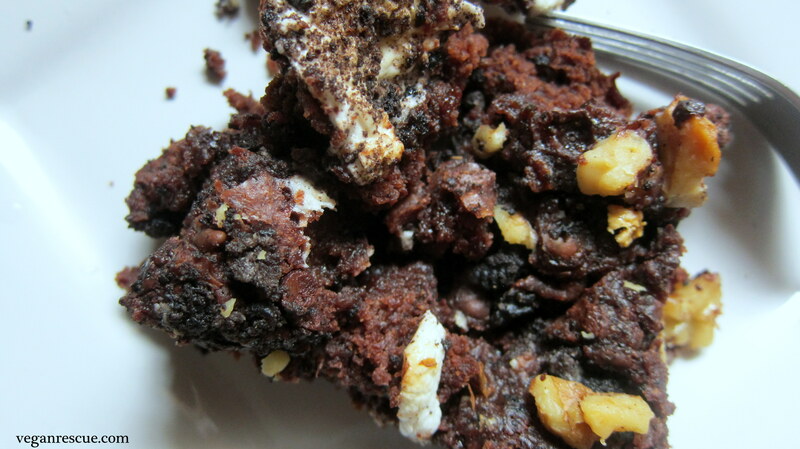 Rocky Road Brownies are Dandy! Another kind of Brownie. 🙂 People seem to like my Brownie with Salted Caramel recipe so I’m sharing another kind of brownie for you guys. This recipe is more cake-like but holds up the toppings well. I prepared this in an 11×7 brownie pan to make these so the brownies will fluff up. If you use a different pan size just watch your timing. 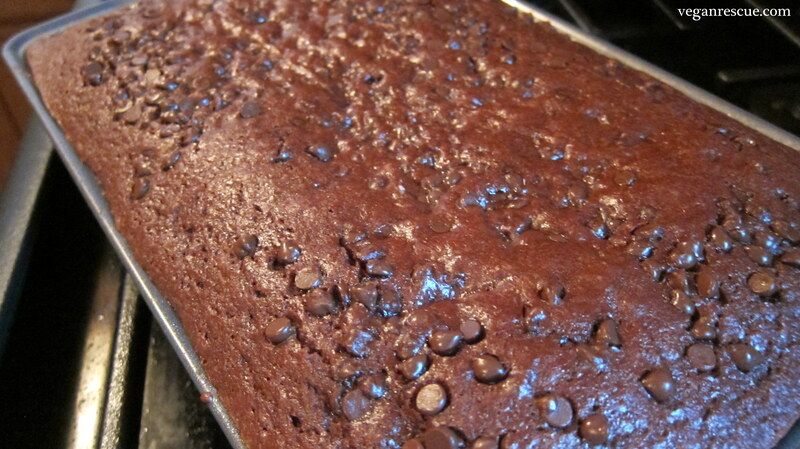 I say this because I make this brownie recipe also without the toppings in a larger pan and it bakes for 30 minutes. However, the Rocky Road way needs to bake a little longer (maybe it’s the chocolate chip topping). I made these for work today, someone in the office decided we should all bring some food in since we’re all blessed to be working the day before a holiday [please feel the sarcasm]. 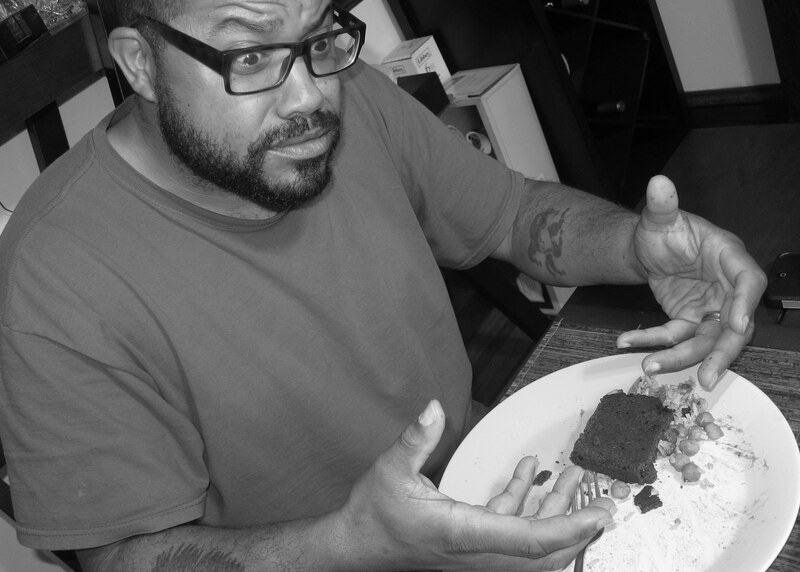 So I made these and my always coveted Carrot Cake…oh I made Peanut Butter Balls too. Can you tell I like to cook/bake yet? 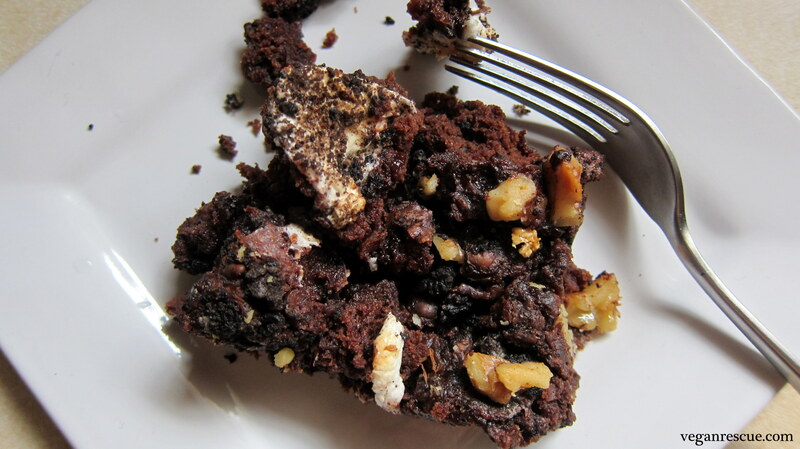 This recipe uses Dandies Vegan Marshmallows – and people thought vegans couldn’t eat marshmallows ever again… I love this particular brownie recipe with them because the brownie base is not over sweet so it can use the added toppings. 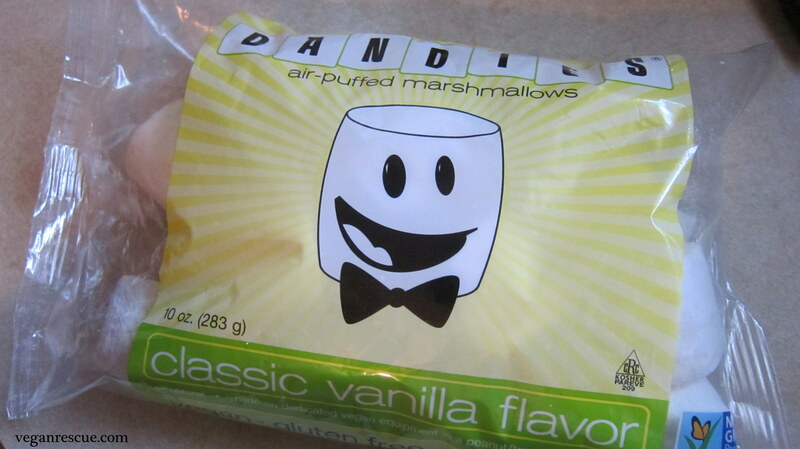 Dandies are dandy – Cruelty-Free, Non-GMO, Gelatin-Free and Gluten-Free. Enjoy! -Preheat Oven 350 degrees F. Prepare 7×11 Brownie Pan (Earth Balance/Flour or vegan cooking spray if you prefer. -Combine all dry ingredients – whisk together. Now ditch the whisk (as I always say) and incorporate wet ingredients mix with a spoon until combined. (At this point if you’re not making Rocky Road – you can just add chocolate chips into the batter directly). For Rocky Road – add chocolate chips on top. -Bake at 350-degrees for 40 minutes – checking for doneness after 30 minutes with a toothpick (toothpick should come out clean – in the center avoid a spot near a chocolate chip to not confuse the test). -Chop Dandies into quarters and then those pieces in half. Shoot for bite-size pieces. (Tip: Wipe the knife blade with additional Canola oil –since it’s already out – so the blade cuts clean thru…it can get a bit sticky). -Add crushed Sandwich cookies, walnuts and top with Dandies and bake for an additional 10 minutes ‘marshmallows’ should just get that golden color a bit. Enjoy! -Combine all dry ingredients – whisk together. Now ditch the whisk and incorporate wet ingredients mix with a spoon until combined. (At this point if you’re not making Rocky Road – you can just add chocolate chips into the batter directly). For Rocky Road – add chocolate chips on top. 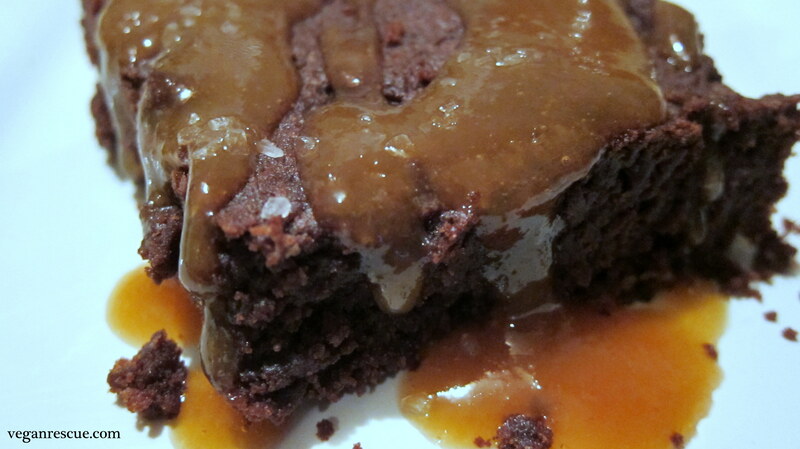 These unpretentious little brownies took a luxurious trip to the dark side with caramel sauce (sinful). I’ve made countless Brownies since I’ve become Vegan – fudgy ones, cake-like brownies and even tried various recipes online in the past…you name it. This brownie was just another one of my creations to add to the brownie collection. More people really should bake in my opinion. Brownies, Cookies and Cake are pretty much the easiest thing to make. Mix a few ingredients together and 10, 15, 20 minutes later you have dessert! 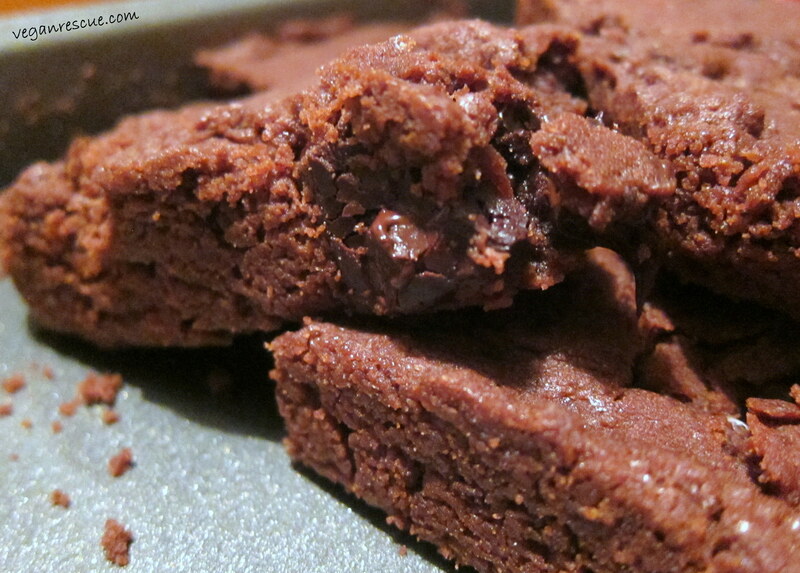 These brownies came out light and crumbly, they were not considerably sweet either. 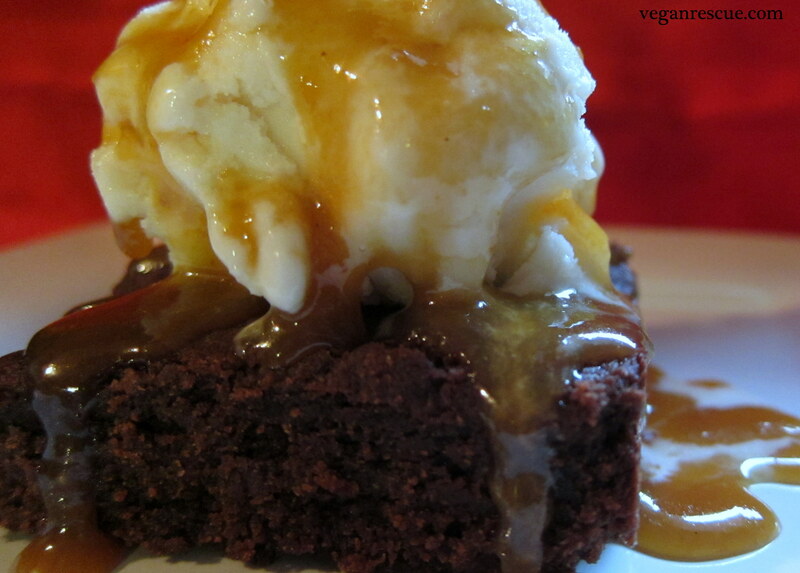 However, the caramel sauce is sweet and provided that perfect balance for the brownie in this recipe. 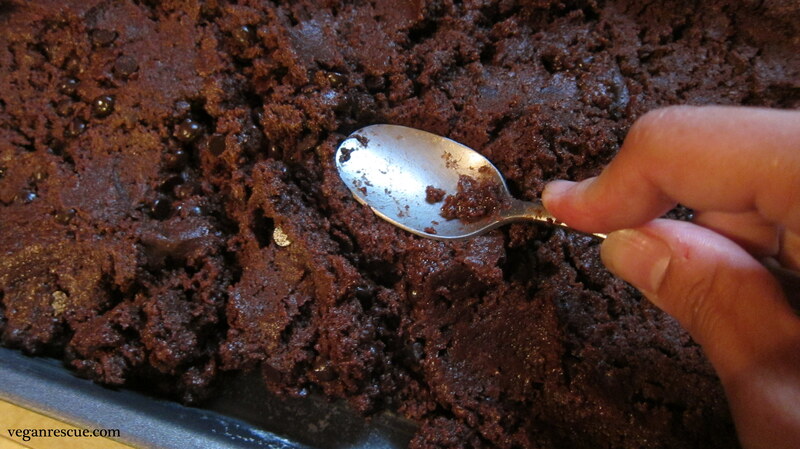 I kicked the brownies up another level by sprinkling course sea salt on top…oh my! Oh wait, what is this…another level of guilt? Of course, so I added Ice cream to boot. I used So Delicious Vanilla Ice cream. -Heat oven 350 degrees and prepare brownie pan (11×7) – grease (earth balance butter) / flour. -Combine dry ingredients – whisk together. Then add wet ingredients stir to combine using a spoon, adding Chocolate chips last. 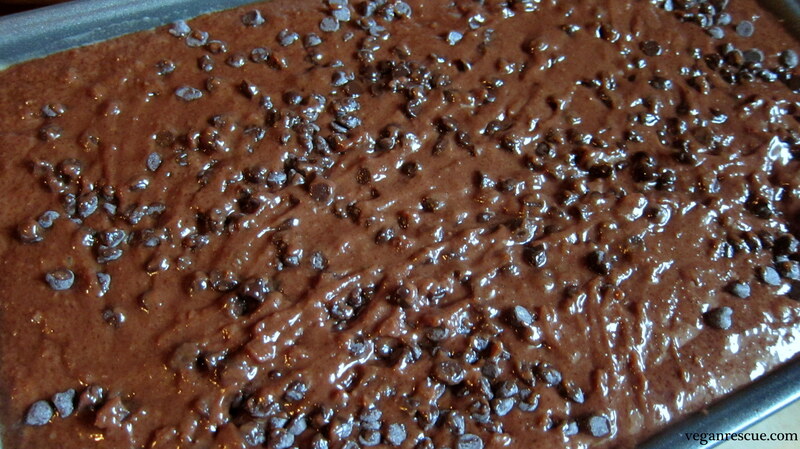 -Press mixture into prepared brownie pan and bake for 20 minutes. Enjoy! 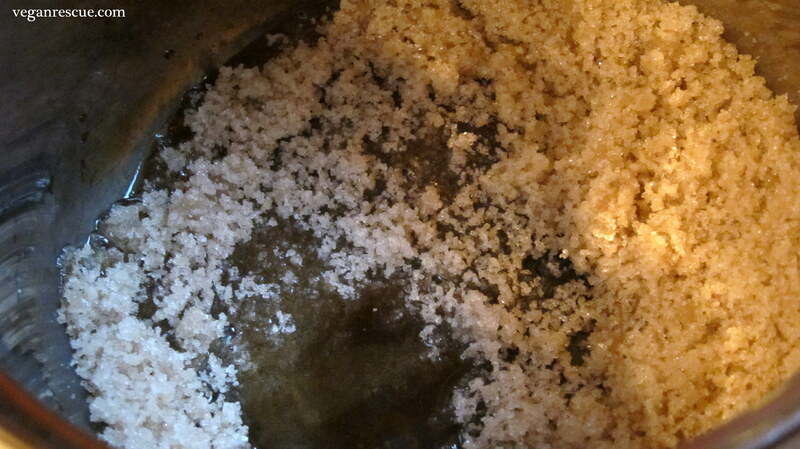 -In saucepan, heat sugar over low heat until sugar begins to dissolve. -Carefully add Earth Balance and slowly stir in Soymilk until sugar dissolves. 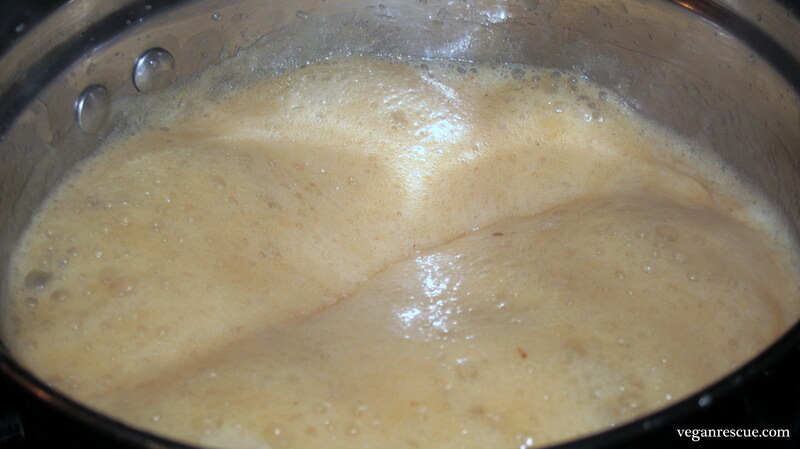 -Whisk in Cream of Tartar and Agave allow mixture to come to slow boil for about 10 minutes. Reduce heat to simmer for another 10 minutes. Turn off heat allow mixture to thicken up. 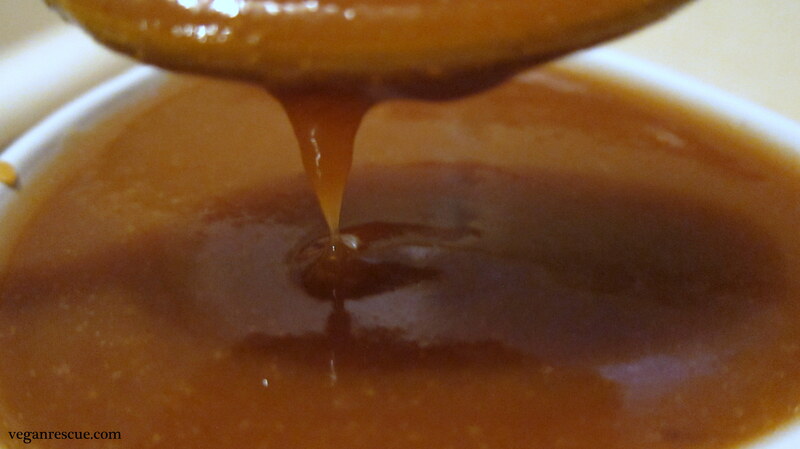 -When serving up a drizzle of the caramel sauce, sprinkle with some course sea salt.